From left, Kevin Holt and Randy Hazelton of H&H Hospitality. As part of its massive concessions overhaul that began several years ago, Atlanta airport officials are currently looking to bring new burger restaurants to its A and B concourses. The two new restaurants would replace existing locations of Krystal and Checkers, according to Hazelton. Bids are due Jan. 13. Hazelton added the company is most interested in the Concourse B location. That’s because H&H Hospitality has partnered with Concessions International since the joint venture was awarded a contract in 2012 to revamp Concourse B with new food and beverage options, such as LottaFrutta, Paschal’s and Proof of the Pudding. For H&H Hospitality, the Shake Shack bid marks an opportunity for the company to fly solo on an airport project and beef up its concessions experience. H&H Hospitality is the same group that brought Cafe Circa to the Old Fourth Ward neighborhood in 2007 just as Edgewood Avenue was beginning to transition into a nightlife hotspot. The company could face stiff competition, though, at the airport. A November meeting regarding the burger concession contract brought out dozens of interested people, from large foodservice companies including Delaware North and HMSHost, to representatives from brands such as Smashburger. Yet, Hazelton said he feels “pretty strong” about his company’s proposal and added Shake Shack is on an aggressive growth path as last year it raised $105 million in an initial public offering. Shake Shack, which calls itself a “modern day roadside burger stand,” was founded by Danny Meyer’s Union Square Hospitality Group LLC. Today, there are more than 60 locations across the globe. But, Shake Shack has just a few airport locations, including at New York’s John F. Kennedy International Airport and at the Dubai International Airport. Shake Shack opened its first Atlanta restaurant in fall 2014 in the Buckhead Atlanta development and instantly drew long lines of customers. 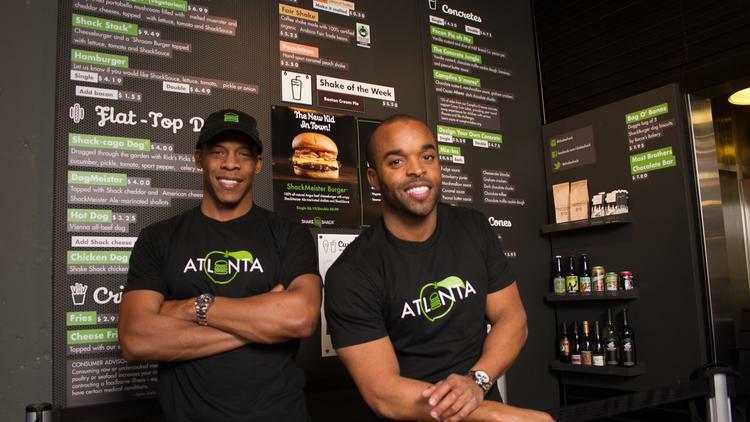 Shake Shack could also be looking at a spot at the Atlanta Braves’ new home, SunTrust Park. Atlanta Business Chronicle reported last July that the team was in talks to bring the brand to its mixed-use project, The Battery Atlanta, which will surround the new ballpark in Cobb County.